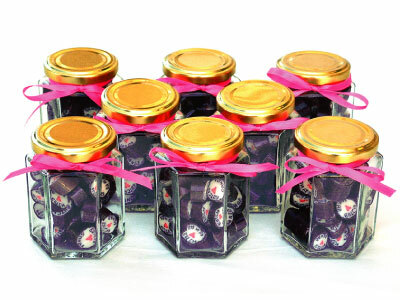 Petite Jar Packaging: This classy glass jar shows off your candies with flair. The 6-sided hexagon shape is 3.5" tall with a gold lid and holds approx. 125g or about 33 pieces. Shown with optional color label. Click here to go back to packaging options. There is a minimum order due to the nature of making the personalized candy, and is equal to about 22 lbs. of candy.